Enteral feeding tube is employed for feeding of critically ill patients who are unable to eat. In the cases of oral medication administration to enterally fed patients, some potential errors could happen. We report a 53-year-old man who was admitted to intensive care unit (ICU) of a teaching hospital due to the post-CPR hypoxemic encephalopathy. The patient was intubated and underwent mechanical ventilation. A nasogastric (NG) tube was used as the enteral route for nutrition and administration of oral medications. Oral medications were crushed then dissolved in tap water and were given to the patient through NG tube. In present article we report several medication errors occurred during enterally drug administration, including errors in dosage form selection, methods of oral medication administration and drug interactions and incompatibility with nutrition formula. These errors could reduce the effects of drugs and lead to unsuccessful treatment of patient and also could increase the risk of potential adverse drug reactions. Potential leading causes of these errors include lack of drug knowledge among physicians, inadequate training of nurses and lack of pharmacists participation in medical settings. Many patients admitted to intensive care units (ICU) can not use normal oral intake because of swallowing problems such as intubation, deep sedation or concurrent diseases, and they need to apply the other routes of nutrition and drug administration such as parenteral route or administration through feeding tube. When patients with enteral feeding tube need to take oral medications, they become subjects for higher risk of errors and problems such as tube occlusion, wrong administration techniques and inappropriate dosage form selection. , The medication errors in ICUs have higher incidence than any other medical units because of patients status (complex diseases, unconsciousness) and polypharmacy. As reported in one study, medication administration errors accounted for 3.3% of all administered drugs in ICUs. In another study it was shown that 74% of hospital personnel had employed at least two wrong methods of drug administration through feeding tube. In present report, we describe a case with several medication errors occurred during drug administration through enteral feeding tube. A 53-year-old man with a past history of hypertension was admitted to the emergency department after a car accident in which he had experienced multiple traumas and right humerus fracture that necessitated immediate surgical intervention. During surgery, the patient developed cardiac arrest and after cardiopulmonary resuscitation (CPR), was admitted to the ICU with hypoxemic encephalopathy. The patient was intubated and underwent mechanical ventilation. He also developed myoclonus seizure the day after admission to the ICU. NG tube was used as enteral route for providing the patient with nutrition and also administration of oral medications. Patient nutritional regimen include: 200 cc/3 hr of standard enteral feeding formula at 12 am, 6 pm, 24 pm, high protein formula at 9 am, 9 pm, and high fiber formula at 3 am and 6 am. 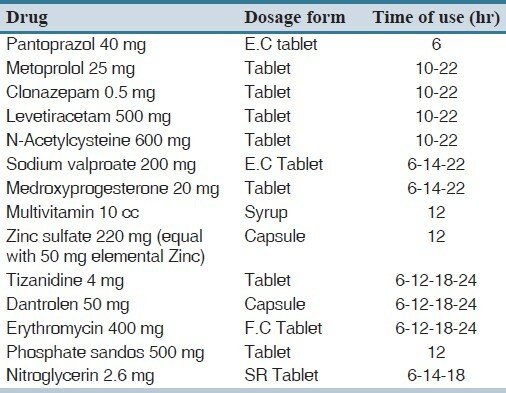 The patient's oral medications are shown in [Table 1]. Oral medications were crushed in a mortar then dissolved in 40 mL of tap water and were given to the patient through NG tube according to the scheduled time table. As seen in this case the errors observed in the ordering and administration stages lead to improper administration of dosage of drugs, lower effect of drugs and risk of potential adverse drug reaction. The physician may have inadequate information about oral dosage forms, pharmaceutical knowledge or selection of correct dosage forms for administration via feeding tube. Computerized system in ordering and dispensing medicines can alert personnel when errors of drug interaction, drug incompatibility and inappropriate dosage form selection occur. , Lack of such an organized system may lead to increased number of medication errors. Help physician in dosage form selection, choosing therapeutically equivalent medications with liquid dosage forms, or proper extemporaneous preparation of a liquid form of administered drugs. Educate nurses regarding administration of drugs through feeding tube. Supervise nurses in order to reduce drug administration errors. Provide standard guidelines for different medical units entitled administration of frequently administered drugs via enteral feeding tube. These are comprehensive references; provide guides about suitable dosage form for administration through an enteral feeding tube and the optimal technique to do. It is essential for Health professionals that use from these resources for making right clinical decisions, decrease errors and improve the quality of medical practice. 1. Cornish P. "Avoid the crush": Hazards of medication administration in patients with dysphagia or a feeding tube. CMAJ 2005;172:871-2. 2. Beckwith MC, Feddema SS, Barton GR, Graves C. A guide to drug therapy in patient with enteral feeding tube: Dosage form selection and administraion methods. Hosp Pharm 2004;39:225-37. 3. Boullata JI. Drug administration through an enteral feeding tube. Am J Nurs 2009;109:34-42. quiz 3. 4. Calabrese AD, Erstad BL, Brandl K, Barletta JF, Kane SL, Sherman DS. Medication administration errors in adult patients in the ICU. Intensive Care Med 2001;27:1592-8. 5. Belknap DC, Seifert CF, Petermann M. Administration of medications through enteral feeding catheters. Am J Crit Care 1997;6:382-92. 6. Wensel TM. Administration of proton pump inhibitors in patients requiring enteral nutrition. P T 2009;34:143-60. 7. Bankhead R, Boullata J, Brantley S, Corkins M, Guenter P, Krenitsky J, et al. Enteral nutrition practice recommendations. JPEN J Parenter Enteral Nutr 2009;33:122-67. 8. Camire E, Moyen E, Stelfox HT. Medication errors in critical care: Risk factors, prevention and disclosure. CMAJ 2009;180:936-43. 9. Jennane N, Madani N, Oulderrkhis R, Abidi K, Khoudri I, Belayachi J, et al. Incidence of medication errors in a Moroccan medical intensive care unit. Int Arch Med 2011;4:32. 10. van den Bemt PM, Cusell MB, Overbeeke PW, Trommelen M, van Dooren D, Ophorst WR, et al. Quality improvement of oral medication administration in patients with enteral feeding tubes. Qual Saf Health Care 2006;15:44-7. 11. Leape LL, Cullen DJ, Clapp MD, Burdick E, Demonaco HJ, Erickson JI, et al. Pharmacist participation on physician rounds and adverse drug events in the intensive care unit. JAMA 1999;282:267-70. 12. Phillips MS. Handbook of drug administration via enteral feeding tubes. Am J Pharm Educ 2007;71:99.